If this doesn’t make your mouth water in anticipation on those cool Fall or Winter days nothing will. I use salmon mostly, but you can substitute or add most any type of seafood. 1. Sauté bacon, then add butter, onion, broth, celery, and garlic powder & cook until onions, carrots, and celery are tender. Stir in potatoes, old bay seasoning, parsley, bay leaves, salt, pepper, and dill. 2. Bring to a boil, and reduce heat. Cover, and simmer 20 minutes or until potatoes are tender. 3. Stir in salmon, milk, creamed corn, flour, cornstarch, and cream cheese. Cook on medium, stirring frequently until heated through and cream cheese is melted. 4. Serve steaming hot with oyster crackers. Please let me know how you like it. It’s one of my favorites. The key is to catch the salmon this weekend while I'm up there. Otherwise, I'll have have to use some brown trout fillets. Halibut will work too. Sounds good. Chaos, Try this. roll a Halabut steak in flower ,put it in a bake pan and cover with milk, salt and pepper dot with butter, about 1/4 tea spoon size chunks. Set oven to 350Deg. bake about 20min. You decide when its cooked to your liking. Hope you like it. Mike. I tried the chowder recipe today and it was fantastic. Very rich and tasty. I made cheese and garlic biscuits to go with it. Girl friend said it was the best soup she ever had. I made up the recipe myself and it's always good to hear what folks think of the stuff I make up. I'm working on a book of recipes titled The Adirondack Series of Recipes by Musky Bob. PS: Don't give her my recipe. It's a secret. Make sure you let us know when your book will be available. I will be giving this chowder recipe a try this winter. By the time stamp on your entry it looks like you did not fish this weekend either. 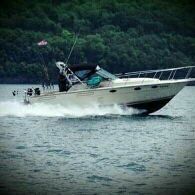 Hoping on getting out this saturday for one last trip. You done for the year? Hey Jim, I've been getting ready for a garage sale this coming weekend to get rid of some of my STUFF. Hopefully I'll be able to get out a few more times before I think about winterizing the boat. That ought to be a fun thing, not. This is my first year with an I/O so I'm gonna have to go by the book. Hope to see you on the water before winter sets in. Hope you enjoy the chowder. Hey Musky, Just got finished eating my 3rd bowl of your chowder. The whole family loved it. Followed your recipe exactly and would not change a thing. Hey guys, if you haven't tried it you are missing out. Thanks for sharing it MB. Hey Musky, Just got finished eating my 3rd bowl of your chowder. The whole family loved it. Followed your recipe exactly and would not change a thing. Hey guys, if you haven't tried it you are missing out. Thanks for sharing it MJ. That stuff is addictive isn't it? What's nice about it too is that you can use most any kind of fish if you don't have salmon & it still comes out good. I used to make it with cod before I started salmon fishing. 3 BOWLS!!!!!!!!!!!!! That recipe is definitely gonna get used this winter. Maybe take some out on the ice. Just don't share the recipe, it's a secret. The chowder recipe looks awesome Musky. Just don't use Musky as an ingredient in any recipes- (Use Pike) for your book. Just for reference if any of you guys steam clams, or boil shrimp, you could use that broth in place of the can of chicken broth in Musky's recipe.Better flavor if used fresh, or you could freeze it also. MB, We made another batch tonight. My 8 yr old daughter who never, never has seconds was back at the pot for another bowl. Thanks for sharing this!!! Ha ha ha ha, that gave me a good chuckle Eric. I'm glad she enjoyed it. Next time, have her help you prepare it so she can learn how to make it. Hey Ray, great idea, now you can put it in a thermos for on the boat. Don't forget to chew the potatoes. Mamma fixed up a big pot yesterday. That is probably the best fish chowder I've had. I was back for seconds, and no chest pain after two bowls! Maybe 3 bowls the next time. Can anyone say total cholesterol >300?